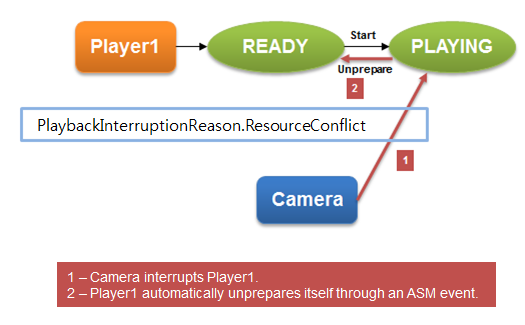 The PlaybackInterrupted event of the Tizen.Multimedia.Player class is triggered when the application is interrupted by another application. The player is paused or moved to the Idle state according to the audio session manager (ASM) policy. You must check the state of the current instance and take appropriate action. Get the UI component to display from the Graphics module. You can display video on a UI layer of Evas, Xamarin, and NUI. Create the display instance with the UI component you got. Set the display to the player using the Display property of the Tizen.Multimedia.Player class. In the case of a video interruption, the player state can be Ready due to the resource restriction in the system. The player has events you can use to receive notifications of player status changes during playback. Since the player engine works asynchronously, you must implement event handlers to ensure that the player flows correctly. When each player operation is completed, the PlaybackCompleted event of the Tizen.Multimedia.Player class is raised. If an error occurs in the player engine, you can be notified through the ErrorOccurred event. After the player state is changed to Ready, you can modify various playback properties, such as volume, sound type, latency mode, mute mode, and looping mode. The player works based on the audio session manager policy. This means that an application can be interrupted by another application. You can change the policy directly by using the Tizen.Multimedia.AudioStreamPolicy class. After the player state is changed to Ready, the multimedia resource is available and you can get content information from the media. You can also get content information in the Playing state, in some cases of playback streaming. The maximum number of player instances is limited by the system and multimedia resources. The maximum number is a system-wide count and it can be applied depending on the CPU model, CPU speed, CPU core number, CPU load from other applications, and the available memory. Thus, the exact number can be smaller than the maximum number, in which case the prepare methods fail. A reasonable working player number is under 10. To free up system resources, stop unneeded players. Use the Display property of the Tizen.Multimedia.Player class to play a video stream. After the player state is changed to Idle, create the display and set the display settings. Use the StreamInfo property of the Tizen.Multimedia.Player class to play a video stream. After the player state is changed to Ready, you can retrieve stream properties. Use the AudioEffect property of the Tizen.Multimedia.Player class to set and get audio effects for the playback. After the player state is changed to Idle, you can adjust the audio effects. Use the SetSubtitle() method of the Tizen.Multimedia.Player class to set a path for inserting subtitles to a video file. After the player state is changed to Ready, you can read the subtitle track. You can set specific URLs for streaming media playback with the Tizen.Multimedia.MediaUriSource class. For HTTP streaming, buffering can happen when the player is prepared. You can receive the status using the BufferingProgressChanged event of the Tizen.Multimedia.Player class. The Tizen.Multimedia.WavPlayer class allows you to play audio resources (media files stored on the device). Use it to play audio and control playback. You can use the WAV and OGG audio formats. You can play a tone or a list of tones using the Tizen.Multimedia.TonePlayer class. To play tones, use a DTMF (Dual Tone Multi Frequency) preset frequency. The possible values are defined in the Tizen.Multimedia.ToneType enumeration. The playback is interrupted and the event is raised when, for example, another multimedia application is run. The player state automatically changes to Paused or Idle according to the session policy. The player error event is raised when the player stops working due to an error. You can use the event to try to recover from the error. For example, try to change the player state to Ready by calling the Stop() method of the Tizen.Multimedia.Player class, and then reset the player by calling the Unprepare() method. The method changes the player state from Idle to Ready, which is required to start playback. This changes the player state from Ready to Playing. The audio file plays until you call the Stop() or Pause() method. To set the display on which the video is played, use the Display property of the Tizen.Multimedia.Player class. This method changes the player state from Idle to Ready, which is required to start playback. This changes the player state from Ready to Playing. The video file plays until you call the Stop() or Pause() method. After the player is reset, it is in the Idle state. Make sure that the display is set, and the player prepared and started. Prepare and start the player, and set the display parameters. Note To retrieve the stream information, the player state must be either Playing or Paused. Retrieve the audio stream details using the GetAudioProperties() method. The method returns an instance of the Tizen.Multimedia.AudioStreamProperties struct containing the audio sample rate (in Hz), number of audio channels (1 for mono or 2 for stereo), and audio bit rate (in Hz). Retrieve the video stream details using the GetVideoProperties() method. The method returns an instance of the Tizen.Multimedia.VideoStreamProperties struct containing the video size, number of frames per second, and video bit rate (in Hz). Retrieve information about the album, artist, author, genre, title, and year using the GetMetadata() method. The available metadata attributes are defined in the Tizen.Multimedia.StreamMetadataKey enumeration. Retrieve the album artwork using the GetAlbumArt() method. The method returns the encoded artwork image. To set the path of your WAV file, you potentially need to retrieve the default path for audio files. To start playback, use the StartAsync() method of the Tizen.Multimedia.TonePlayer class. The first parameter defines the tone type as a value of the Tizen.Multimedia.ToneType enumeration. To play a tone for a specified duration, use the StartAsync() method of the Tizen.Multimedia.TonePlayer class with the duration parameter (the number of milliseconds you want playback to last). When you set the duration to a specified time, playback stops automatically after that time.